When school’s in session this ice season, you’ll be glad the sonar wizards at MarCum are willing to share their homework. Free firmware updates for the LX-6 [Product 'LX-6' not found! ], LX-7 [Product 'LX-7' not found!] and LX-9 [Product 'LX-9' not found! ], that can be installed by the angler in a matter of minutes from the comfort of the own home, will crank up the already impressive performance of the MarCum digital platforms. LX-6 [Product 'LX-6' not found!] and LX-7 [Product 'LX-7' not found!] owners can upgrade to v3.17; LX-9 [Product 'LX-9' not found!] users to v1.29. The updates, available via downloads on MarCum’s website, www.marcumtech.com, include sensitivity/gain adjustments for more low-end adjustability. “More low-end settings will allow for more micro adjustments and improve performance of the automatic- and dynamic-range settings,” explains MarCum Brand Manager Jon Marshall. This improvement will fine-tune resolution, especially in large schools, helping anglers pick out individual fish. “Each fish appears now as a thinner, finer mark, rather than a blocky blip more prone to overlap,” says ICE FORCE Pro-Staffer James Holst. Owners upgrading from version 2.9 or lower will also get chart-zoom functionality. This gives anglers a true depth-zone zoom in “chart” mode, the display option that looks like the screen in a boat-mounted fish-finder. Circular and vertical flasher displays have long allowed for zoom, but MarCum is the only manufacturer that now offers it in chart mode. “So if you prefer chart mode on the ice, you no longer have to give up zoom capability, or switch over to another display option to get a closer look,” Holst says. 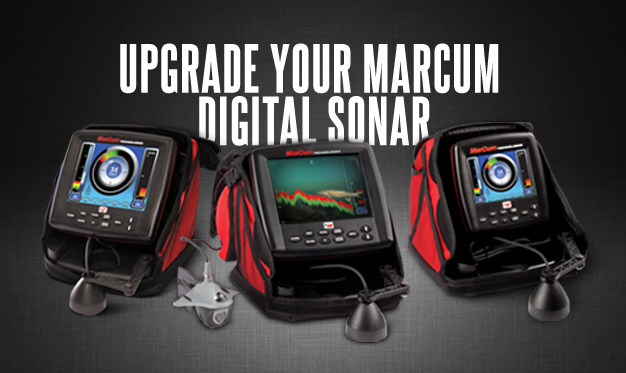 MarCum is the only ice-fishing electronics manufacturer that makes digital units that can be upgraded. The LX-6 and LX-7 update requires a PC computer with 2.0 USB port and a 2.0 USB cable. Do not attempt an upgrade without 2.0 port or cable. The LX-9 update requires a PC computer with a Micro SD slot. You can use the same micro SD card that came with your LX-9, or another card (class 4 or higher 4-gig card required). PCs without Micro SD card slots may require an SD card reader/adapter. Click this link to find the exact download and upgrade instructions for your MarCum unit. This entry was posted in News, Products and tagged Firmware Update, LX-6, LX-7, LX-9, MarCum Technologies. Bookmark the permalink.